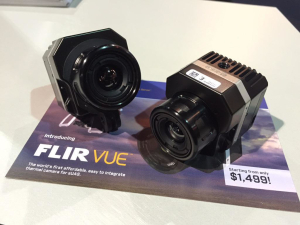 FLIR Corporation, long known for the manufacture of a broad line of electro-optical and thermal imaging systems for everyone from the Military and Law Enforcement, right down to the average smartphone user, has announced VUE. A miniature Drone Friendly version of their popular Quark line of Camera systems, the VUE provides easier integration of thermal sensors for Drones in what I would suggest would be the 450 mm and larger classes of Multi Rotors as well as fixed-wing platforms. A list of features such as multiple lens options, Mini USB connection, 5 Volt DC power in and Analog Video out, make this easy to integrate system a no-brainer for applications requiring a thermal sensor. Add to this FLIR’s reputation for reliability and a price starting at under $1500, and it appears the VUE is poised to dominate the thermal imaging market in the sUAS community. 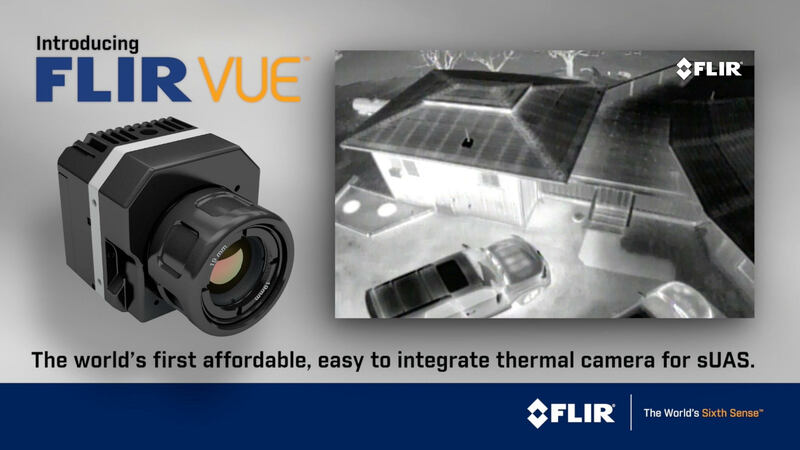 With FLIR Vue™ you get all the thermal imager you need for sUAS operations without having to pay for functionality you’ll never use. Pre-configured to give you optimal imagery in a wide variety of conditions, FLIR Vue is light enough that it won’t throw off your center of gravity or impact your flight times. With simple power-in and video-out connections, it’s easy to integrate and get flying on just about any platform. Best of all, with MSRPs of only $1,499 for 336 resolution cameras and $2,999 for 640 cameras, FLIR Vue is affordable for today’s commercial sUAS operations. FLIR is taking orders now, so if you need thermal imaging for your drone project, check out FLIR. For more information, you can contact FLIR direct by calling (866) 667-7732. Matt Elyash is an instructor for Drone Universities, and has been a pilot since Gerald Ford was in office. A Retired Naval Aircrewman with 24 years of experience in advanced sensor operations for maritime surveillance, he saw the potential of this technology and has been flying fixed wing and multirotor sUAVs actively for over three years. An unmanned aerial vehicle (UAV), commonly known as a drone, an unmanned aerial system (UAS), an unpiloted aerial vehicle and a remotely piloted aircraft (RPA) by the International Civil Aviation Organization (ICAO), is an aircraft without a human pilot aboard. It is remote controlled, sometimes by phone or tablet, but usually with a remote control system. More advanced professional drones may even require multiple operators. More definitions are available in our glossary. Do you need specialized, hands-on drone training that has been customized to fit your industry? Sometimes a custom solution is the best choice. Drone Universities has successfully trained drone pilots across a number of sectors, including but not limited to, Agriculture, Broadcasting, Construction, Emergency Services, Inspections (Building/Industrial), Insurance and Mapping. We have also created specialized curriculum and provided hands-on training for Private Businesses, Railroads, Utility Companies, Wildlife Monitoring Agencies and Zoos.